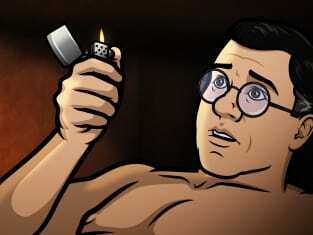 In Dreamland, Archer can't take his eyes off of Lana Kane. Archer Season 8 Episode 5: "Archer Dreamland: Sleepers Wake"
Cyril/Figgis: As the Lord our God Himself is my witness, upon the conclusion of my current business, I shall return to this place, and visit upon you an apocalypse of such terror and destruction that you will rue, RUE, the very fact of your miserable birth!! Coroner: (munches on hot dog) I'll be here! Permalink: You will rue, RUE, the very fact of your miserable birth!! Are you kidding? Dreamland has a whole goddamn Nazi robot farm in the basement. In THIS economy! Permalink: Dreamland has a whole goddamn Nazi robot farm in the basement. In THIS economy!